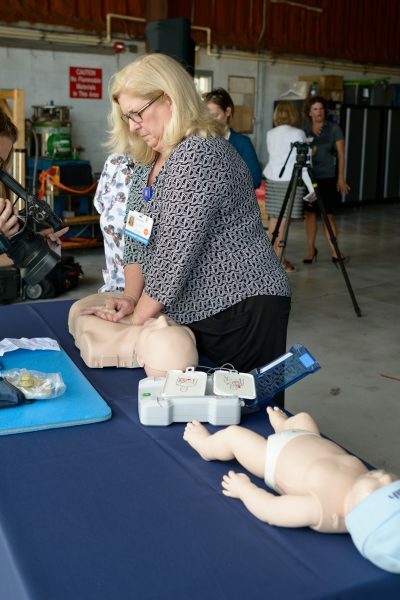 A UF Health respiratory therapist demonstrates the correct way to administer CPR during the PulsePoint launch event. University of Florida Health officials and Alachua County and city of Gainesville emergency first responders have joined to launch a smartphone app that alerts citizens to a nearby cardiac emergency and empowers them to help, which officials say could double the survival rate from cardiac arrest in Gainesville and the surrounding area. PulsePoint Respond is now available throughout Alachua County, thanks to funding from the Jerome H. Modell, M.D., Professorship of Anesthesiology in the UF College of Medicine’s department of anesthesiology. UF physicians Nikolaus Gravenstein, M.D., a professor in the department of anesthesiology, and Torben Becker, M.D., Ph.D., an assistant professor in the department of emergency medicine, collaborated with local officials from the Alachua County Sheriff’s Office, Alachua County Fire Rescue and Gainesville Fire Rescue to get the lifesaving app activated through the county’s 911 system, part of the Alachua County Combined Communications Center. Other agencies, including the Gainesville Police Department, the University of Florida Police Department and the High Springs Police Department are participating in the initiative, and the app notifications will occur countywide. More than 3,300 communities in 42 states have implemented the CPR mobile alert program, which was released in 2010 by Bay Area nonprofit PulsePoint Foundation. The free mobile app alerts potential responders — citizens and off-duty medical professionals — who are within a quarter-mile of the person experiencing a cardiac arrest. The app, which does not alert participants to a cardiac arrest occurring in a private residence, provides directions to the person in need and reminds responders how to deliver hands-only chest compressions. Multiple responders may report to the scene. Civilian responders are granted immunity from civil liability in accordance with the Florida Statute Good Samaritan Act. The alert occurs simultaneously with the dispatch of local paramedics and firefighters. Cardiac arrest occurring outside of the hospital is a leading cause of death in the United States, accounting for more than 1,000 deaths each day. Effective bystander CPR, provided immediately after cardiac arrest, can double or triple a person’s chance of survival, according to the American Heart Association. PulsePoint Respond was designed to increase cardiac arrest survival rates through improving bystander performance and encouraging active citizenship. To date, more than 153,000 users have been notified of a cardiac arrest through the app. David R. Nelson, M.D., interim senior vice president for health affairs at UF and president of UF Health, announces the arrival in Alachua County of the smartphone app PulsePoint. Jim Lanier, technical services division manager at the Alachua County Sheriff’s Office, said the Combined Communications Center is proud to collaborate with PulsePoint to save lives. Joseph A. Tyndall, M.D., M.P.H., interim dean of the UF College of Medicine and chair of the UF department of emergency medicine, said the survival rate with a good neurological outcome after cardiac arrest in Alachua County is now less than one in 10. PulsePoint, he said, has the potential to significantly improve the odds of survival with good neurological outcomes by getting people care even faster. 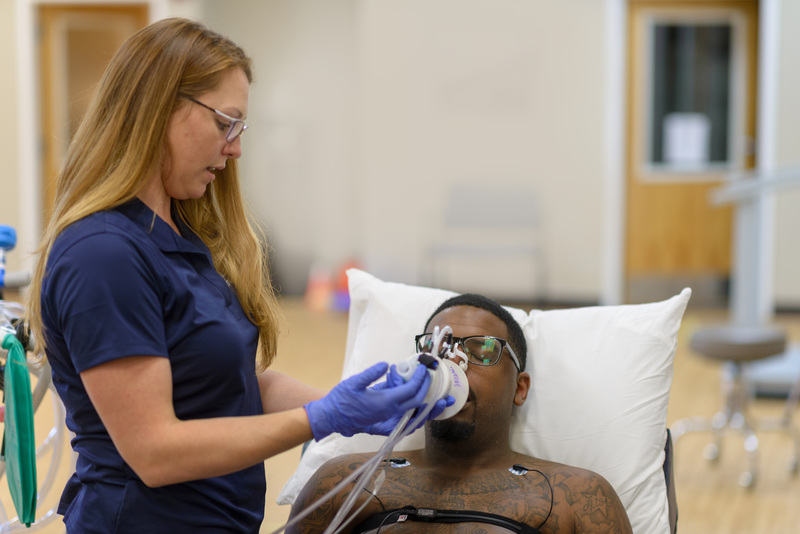 “This is a wonderful way to use modern technology to engage ourselves as health care professionals as well as everyone else in the community in making Alachua County an even safer place to live,” Tyndall said.